When you don’t have much time to make lunch or dinner, (which is most days), it is so great to look in the refrigerator or pantry and find that you have all the ingredients for a special and tasty dish. 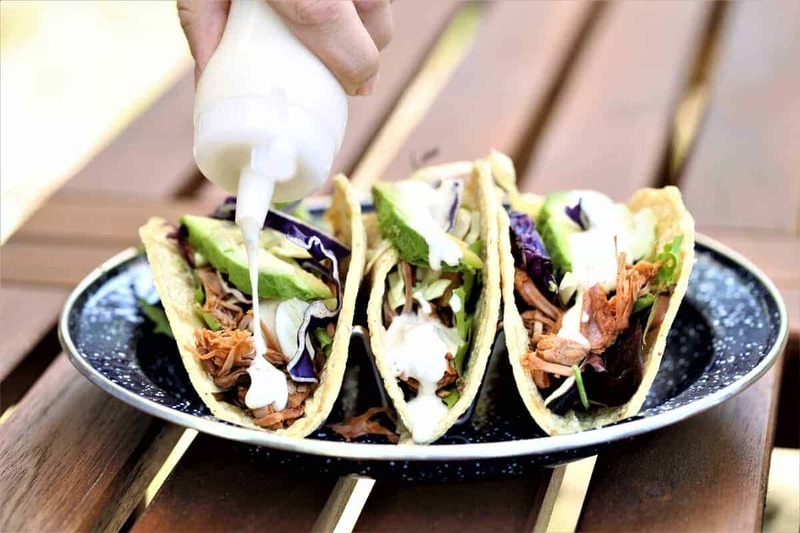 In my kitchen, that would be these Smoky Jackfruit Tacos With Jalapeno Creme. I always have corn tortillas, a can of jackfruit, fresh garlic, cashews and of course avocados, as they are basic staples in my kitchen. 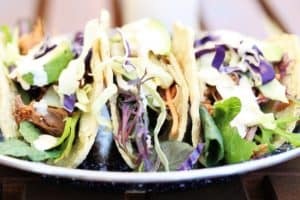 The greens and grated cabbage provide color, fiber and vitamins to the tacos, and when you top them with the jalapeno creme…wow, the flavor is incredible! 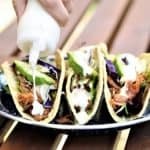 Jackfruit tacos are yum with jalapeno creme. Saute jackfrut in olive oil. Add paprika, salt and granulated garlic. Add cashews, jalapeno sauce, salt, lime juice and zest and garlic. Blend until smooth in blender.